Professional BoatBuilder is offered free of charge to those whose primary employment is in the boat construction, design, and repair fields. While it only takes a moment to subscribe or renew, the approval process may take as long as 2 to 4 weeks. Are you a Marine Professional? 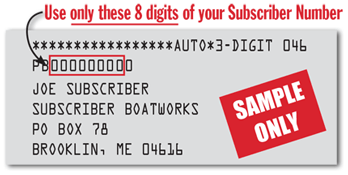 Our auditors require a free subscription form to be filled out in order to receive Professional BoatBuilder magazine. You can complete the online “SUBSCRIBE” form, or call, write, or fax us requesting a form be sent to you and/or your company. Those who do not qualify may purchase a subscription. Please contact us regarding U.S., Canadian, and overseas subscription pricing. You can find your account number above your name on your mailing label. Please keep your account number for future use when inquiring about your account. Professional BoatBuilder is a bimonthly magazine (six issues a year.) Your copy should reach you during the first week of the cover date. If you live outside the U.S., subscriptions may take several weeks longer to arrive. Please remember to renew your subscription once a year to keep it coming in the mail. Our auditors require up to date information on you and your company to qualify for the free subscription. We will send you reminders to do this. Change of address can take up to 12 weeks to process, so please let us know as soon as possible regarding an address change via mail, fax, phone, or online. You will need to provide us with your name, company name, old and new address when calling, faxing, or writing. You will need your 8 digit account number to access your account online. Please see sample label above.